Finally I was going to France and boy was I excited! 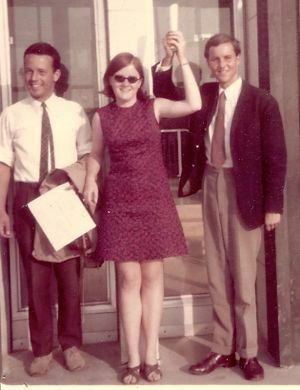 As a French major in the 1960s, I had long wanted to go to France. 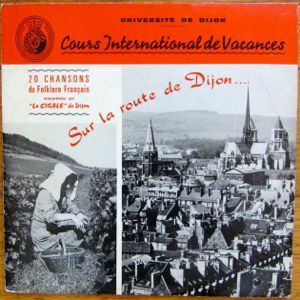 Finally I got my chance, being accepted to the Université de Dijon's International Summer School in 1968. You may remember les événements de mai, the major student and worker demonstrations that virtually shut down France for a period of time in 1968. That was the France I headed to in early July, with no communication from the University for a couple of months, just hoping the summer school was still operating. It was. At that time the year-round enrollment at the University was 9,400 students. It became the Université de Bourgogne in 1984 and today serves 32,000 students. The Cours International de Vacances was even smaller, so I guess it's not a surprise that I didn't recognize anything when I went back to visit in 2013. Some things don't change. I flew to Paris and took the train from the Gare de Lyon to Dijon. There were no TGVs, of course, so the trip took a lot longer than it does today. I learned a lot that summer. In addition to improving my French, I was introduced to Kir and to a lot of fine French wine. I ate this strange stuff called yogurt, that no one in the US ate at that time. I tried escargots (snails) and boeuf bourguignon and a lot of French pastries. I had the chance to visit the Clos de Vougeot and the Hôtel Dieu in nearby Beaune, and got to spend a day with a family near Meursault. I met students from around the world and spoke French more than I ever had. I slipped off to Paris with 3 friends for a magical Bastille Day weekend. The most memorable part of my summer was taking cooking classes in Dijon. A local chef training school whose students were not in session opened up to the International Summer School. For the vast sum of five francs (about one dollar at the time), I could go to the school and work with professional chefs to prepare a three-course French meal, and then eat it! I was in heaven. We made Bourguignon dishes about half the time—escargots, oeufs en meurette, boeuf bourguignon, coq au vin—and dishes from other regions of France the rest of the time. I learned to make mayonaise and chopped a lot of garlic and parsley. While dinner was cooking a sommelier would talk to us about the region of France the menu came from and what wines should be drunk with each course. Then we'd sit down and be served the meal we had helped prepare, along with wine. Sometime before dessert the chef would start singing, and soon the whole group would be happily toasting each other and singing old French songs like Sur La Route de Dijon or Chevaliers de la Table Ronde. I came home bringing crème de cassis so I could make kirs, jars of Dijon mustard, a set of stained recipes annotated in a combination of French and English, three dozen snail shells, along with escargot plates and clamps, a certificate from the course, and a lot of good memories. In the mid 1970s, I got to return to Burgundy with my parents. We visited Dijon and Beaune and toured the Château de Pommard, just outside of Beaune. We enjoyed our treasured bottle of wine from the Château later in our travels. To be honest, I don't remember much else about Dijon. Like many smaller French cities, its tourism infrastructure was not well developed in 1968, and other than the Palais des Ducs de Bourgogne with its old museum and a few churches, there wasn't much to see. Today Dijon is a vibrant city with lots to see and do, and I was delighted to go back. 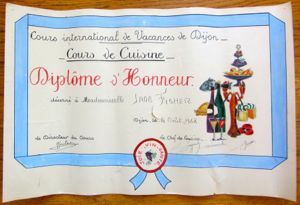 Above, My diploma of honor from the cooking course, Dijon, 1968. Below, Getting my academic diploma from the University along with two Dutch friends. I got "Assez Bien." Above, One of my favorite souvenirs: a small 33 RPM album of traditional French songs (many of which we sang at the cooking class). 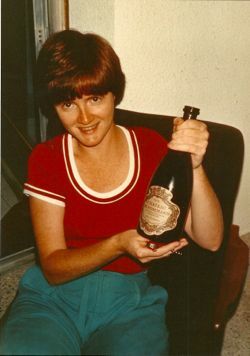 Below, Showing off the bottle of Château de Pommard 1973 that we bought (and drank) in 1977.